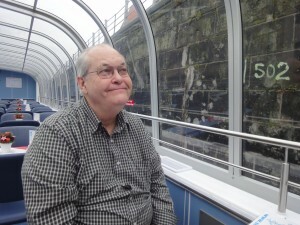 Whereas we did go on a shopping spree, the title refers to the Spree River. Pronounced Shpray. At any rate, we were tired enough to get on the boat early and order Coke Lights and, as I had forgotten my notebook this day, we tipped the waiter to find me some paper and a pen. He was pleased with his tip. And I was pleased to make notes and knock back the colas. We were docked at the Fredrichstrasse Bridge, which is the one Jason Bourne climbs under in “The Bourne Supremacy.” He did not jump on our boat however. We watched the other cruisers go by, including one line called “Berlin Eisbreacher,” which you will translate if you say it our loud. It had a large angular metal polar bear as the figurehead, which seemed to function as an air intake. As we cast off, we tuned in our handheld radios to get our tour in English. We passed the Hauptbahnhof [Central] railroad terminus, also shown in Bourne and the Berlin Emsemble Opera House, where, in 1922, “Mac the Knife” [“Die Moritat von Mackie Messer”] debuted in “The Three Penny Opera.” I challenge you to sing this song in German. We approached the 4 huge buildings for the national government. The Reichstag now sports an enormous glass dome, which is a favorite with tourists. From the river, I thought they looked like so many hamsters in a Habitrail. Well, they did. The government buildings sprawl on either side of the Spree, so they have pedestrian bridges going across. There is the bridge for the likes of you and me, and there is a higher one for government officials, called “The Chancellor’s Catwalk.”. The new caste system alive and well. The Spree is a very slow running river, as it originates at a low rather than mountain source. Nor is it deep. Within Berlin, it splits into several channels, including one that runs off to Humboldt, and one which circles Museuminsel [Museum Island]. This latter is too shallow for the cruise boats. We cruised along the Tiergarten, the park which saved the city from starvation right after WWII, when the Brits created 2000+ plots to grow food. All the trees had already been cut down for fuel. One enormous lavish palace we passed turned out to the stables for the horses, sleds and carriages of the Hohennzollerns, the ruling family of Prussia [pre-Germany]. Hitler refused to allow the historic Molke Bridge to be blown up and so it was that the Soviets got their tanks into Berlin ahead of the Americans, a tragedy for Germany. 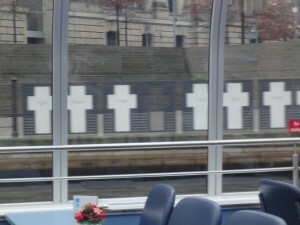 These crosses at the government building commemorate those who died trying to swim the Spree to freedom in the West. 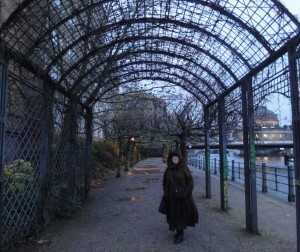 After the cruise, we had a 3 pm lunch, listening to Tammy Wynette “Stand by Your Man.” Then we walked the river walk on the other side of the Spree, through intriguing metal filigree pavilions and ruined buildings. In the winter gloom these looked remarkably sinister, but are likely charming in the spring, but for the graffiti. We returned to the Pergamon Museum, where our passes were supposed to get us in anytime, but the guard refused us; and maybe rightly so, since there were many tour busses lined up, and the museum could have been full. But the guards of all the museums loved throwing their power around, arbitrarily deciding from day to day how you could wear your sweater. My main beef with them though is that they really didn’t know the collection they were guarding. 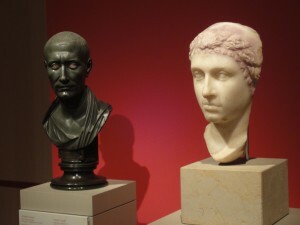 So we returned to the Neues Museum to visit [green greywacke] Caesar and Cleopatra; Hadrian, Sophia and Antinuos; and the bookstore. Back in the hotel, we packed for the early getaway in the morning. When we arose, we discovered a miserable rain falling and decided to splurge on a taxi. The driver insisted on checking our room number so that we weren’t stealing someone else’s cab [very nice, I thought] and he bundled all our baggage into the trunk, which took some doing. He spoke excellent English and entertained us with a history overview all the way to the airport. We felt great when we passed the airport bus literally sardined with miserable people [and, we knew, nowhere to stash their luggage.] Some things are just worth throwing money at. Our driver only charged us €19,30 and Ron gave him €30. “Merry Christmas,” said Ron.